The other night, we felt like doing something different from the usual, so I suggested it would be a good time to take our occasionally-discussed trip to Molten Core. 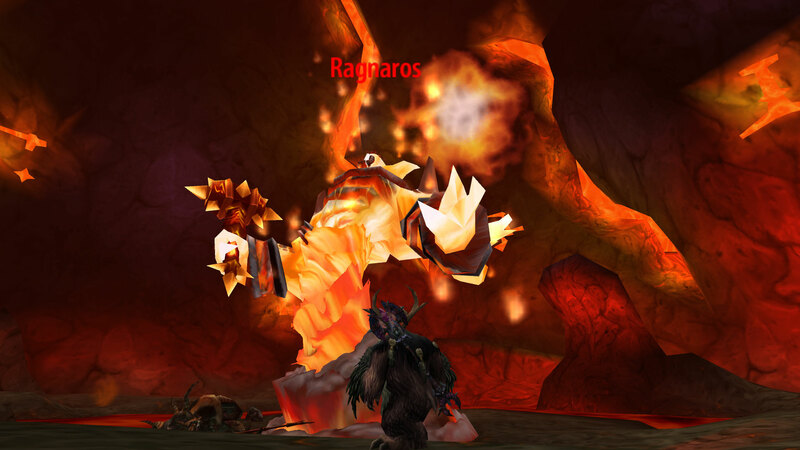 While Reversion had been inside a few times back in the day, on his hunter, I didn’t raid at all until WotLK and had set foot in the place only once, back when Wrath was new – and that attempt didn’t go anywhere. So we flew out there. I knew I’d want Analogue for the attempt, and we weren’t sure whether Reversion should take his hunter or his druid so he started on the hunter. I activated my boomkin spec but left on most of my healing gear; hit wasn’t a concern since everything would be lower level than me, and my healing set far outpaces my boomkin set. I did equip my Nibelung (everyone has one of those I think; I got mine for 500 gold in a GDKP) and switched out my Abacus trinket for one that didn’t have a healing proc. We did the first few corehounds and decided to get Reversion the druid instead of Approximate the hunter; Approximate’s pet just couldn’t hold aggro. That worked better; things died fast, Reversion held aggro and barely needed healing at all, and I could get in a proper Eclipse rotation. So there we were in Molten Core, two druids where 40 man packs used to tread. We could skip a lot of trash. Most of it ignored us as we walked by, even when I fell into the lava and had to find a way out. The first pair of bosses was in a room with giant packs of corehounds. A note of warning about these corehounds; they were one of the two spots we had trouble with, because you have to kill the whole pack at once or they come back up. Don’t do what we did and take the boss and two packs. It worked, mostly because my healing gear gave me insane mana regen rates, but I think it took ten minutes to finally get them all dead at once. AOEs are your friend here. 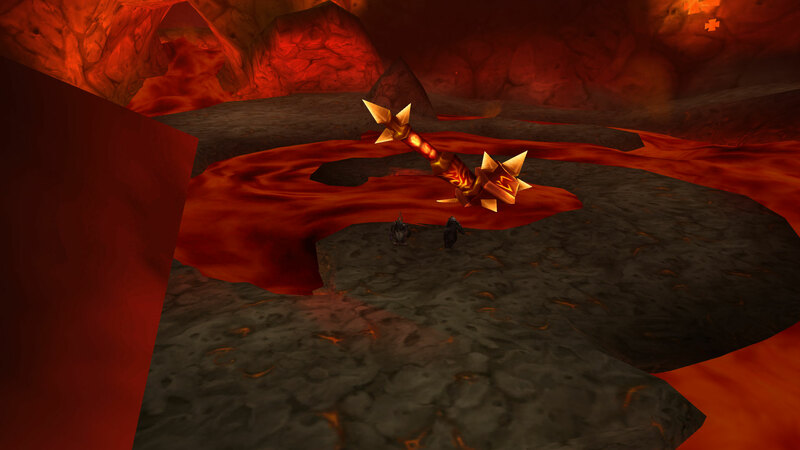 The denizens of Molten Core are an eclectic bunch of firey corehounds, firey elementals, firey imps, and firey Nagas. (I was a bit surprised at that last). The color scheme is a rather unrelenting brown, gray, and red. While it has it’s own charm, it’s not the sort of place I’d build a summer home. There’s also ten bosses, all of which have to be killed. The first 8 sitting on runes on the ground and you can’t get the penultimate boss to appear until you get them all. And he summons Ragnaros for you so you kind of need him. If you’re thinking of your own Molten Core adventure, check out wowwiki: http://www.wowwiki.com/Molten_Core and think about your own strategies. The other spot where we had trouble was with Baron Geddon, a fire elemental. He does a Living Bomb effect on one of his targets which kicks them high into the air. The room he is in has a very, very high ceiling. You take a lot of fall damage. We died to him because we didn’t pay attention to him. We came back and fought him in the corridor leading to his room; now we weren’t taking hardly any fall damage at all. After him it was just a matter of finding the rest of the guys to kill. Aided by Reversion’s dim recollections and internet resources, we found everyone and then went to confront Majordomo Executus. He’s a big wimp and when you kill his friends, he surrenders. You then go meet him by Ragnaros’s pit and he summons Ragnaros for you. Look, I was impressed. I haven’t done that many raids and none of the bosses I’ve confronted have been like this. Onyxia? Dragons are supposed to be huge. I kill dragons all the time. Heck, I RIDE dragons. Illidan? Met him after I’d already been through Naxx, he was a pushover. Haven’t done Ulduar; nothing in Naxx had this level of “wow”, and as far as my ICC progress, well, Saurfang is very inspiring but he IS just a lone orc, and none of the LK’s other buddies are that impressive. Yeah, they regularly tear my branches off and beat me around the head with them, but this guy was just amazing. I bet I feel impressed when I get to the Lich King though. For all that, he died…. gloriously. And here we are, posing in front of the spoils of war! I wish we could carry that hammer around, that would be cool. You can barely see us! Yay! MC is fun, and it is kinda funny how you can 2-man a 40-player instance now. In fact druids, DKs and paladins can probably solo it. Maybe hunters too. Yeah if my hunter had a BM spec or some stam gear I might have done it that way. Instead my hunter did so much damage it just ripped things off my pet. Except the part where the living bomb got us (should have looked up the boss strats first) it was pretty easy. I look forward do doing more old runs I missed before. Molten Core is great. A few guildies and I clean it out on a weekly basis for some of the drops and Tier1 gear sets (I am Still missing my Chestpiece and Helm sadly). You CAN get Rag’s Hammer (a slightly smaller version granted). Requires a Sulfuron Hammer (Blacksmithing recipe which requires various reagents that drop in MC including 8 Sulfuron Ingot which is a rare drop off of Golemagg) and the Eye of Sulfuras (Extremely rare drop off of Ragnaros himself). I have my Eye, the recipe, and half the ingot and am leveling a Blacksmith just to make my hammer. Classic content’s fun lays in the challenge. Glad to hear you druids had fun and good thing you didnt have to go tree, you might have burst into flames.